This week, Jimmy Fallon took the opportunity to invite the talented One Direction gang to appear on The Tonight Show. 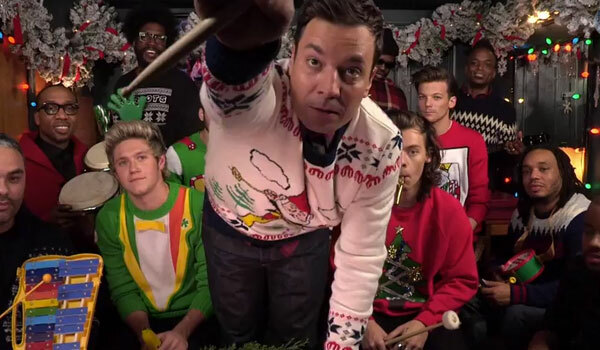 One Direction, along with Fallon and The Roots, bundled up in some ugly Christmas sweaters to serenade us with a jolly version of “Santa Claus is Coming to Town.” Check it out, below. Fallon is a big fan of having musical guests onto his shown and an even bigger fan of involving himself in musical moments during his late night gig. The “Santa Claus is Coming to Town” segment is actually a recurring one on the show, featuring a different musical guest and song each time. The goal is to bring as many voices and classroom objects together to create something spontaneous. Luckily, the hodgepodge of musicians hit the nail on the head this time. We’ve seen Idina Menzel play her huge Frozen hit “Let it Go” with classroom musical instruments and we’ve seen Carly Rae Jepson play her similarly huge hit “Call Me Maybe” in the same fashion, so it’s a little bit surprising that One Direction didn’t choose to do a hit song off of the band’s huge album, Four, which dropped just last month. However, it seems as if they wanted to get into the spirit of the season and have fun with it, and if that was the goal, they definitely accomplished what they set out to do. Normally I’m totally enthralled by trying to play a game of “I Spy” during these videos, spotting all the instruments the gang is playing (the full list is available here), but this time around, I’m totally distracted by those ugly Christmas sweaters. That glittery Christmas tree is pretty bad, but what about the fake, green tux with the bowtie? And does Jimmy Fallon have a Christmas gnome on his shirt? Next year, Fallon should totally do this classroom instruments gimmick for twelve days leading into the holidays with different musical acts. Then, The Tonight Show could market a full Christmas album of this stuff. I don’t know about you, but I would totally be down to hear weirdo versions of Christmas classics like “Santa Claus is Coming to Town” on a regular basis. It certainly beats some of the other Christmas music out there. Just remember, you heard the idea here, first. NBC’s The Tonight Show with Jimmy Fallon airs weeknights at 11:35 p.m. ET.